They do it every season. Pantone, the leading authority on color, releases new colors that you will see in every product where color is a variable: in fashion, in furniture, in automobiles … and in rugs. Dedicated followers of fashion look forward to the hot new colors every season. But even if following trends doesn’t inspire your personal choices, chances are you will find a new color to love. So let’s examine the new colors for Fall 2012. 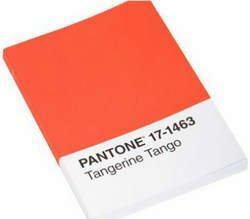 Pantone tells us that Tangerine Tango is the number one hot color for this season, followed by French Roast, Honey Gold, Pink Flamingo, and Ultramarine Green. The color trends for fall are not surprising since they follow closely the trends we saw in the spring that suited the mood of the country — optimistic, yet reserved. Consumer confidence continues to climb as 2012 nears its end, clearly demonstrated in the orange, pink, and green colors that are so lively and vibrant. At the same time, the country is taking it slow and moderating its optimism, obvious in the complementary earth tones of deep brown and gold. What does this mean for you? These colors are strong, yet familiar. If you like being on the cutting edge, you’ll be able to comfortably slip into this color-way while trying something new. There are sure to be fashion-forward ideas for updating a room or decorating your first home. If you know what you like and don’t want to change, you might find these colors make excellent highlights, complementing your current favorites. 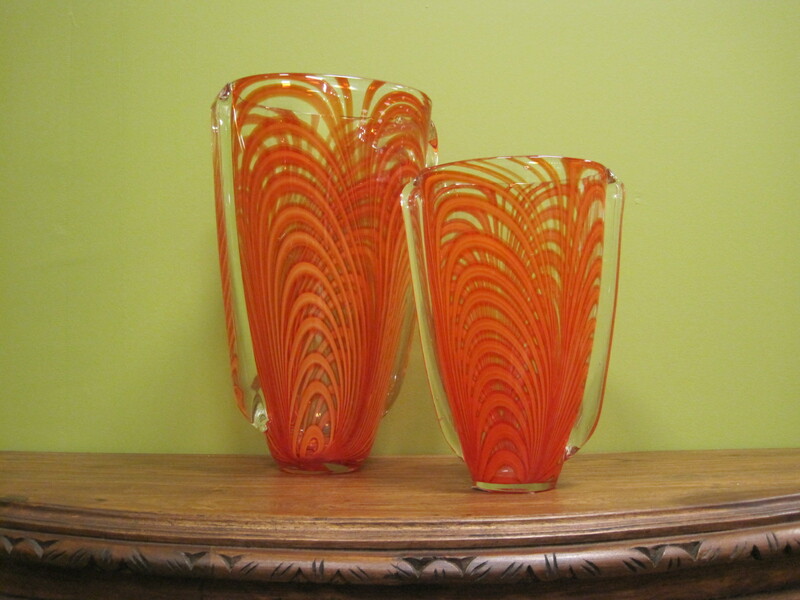 Place these modern glass vases to add a pop of vibrant color. What does this mean for your home? If you decorate (or redecorate) with these trends in mind, you’ll find it easier to match complementary accessories in your local retail outlets. Stick with a basic brown and gold base for your furnishings. Then add the bright, optimistic colors in your rugs, pictures, pillows, and window treatments. Set a bright tangerine orange rug in your den under your deep brown leather sectional. Go ahead and bring a loud, happy pink plush shag rug into your bedroom to brighten up a room that’s held traditional dark wood furniture and kept you stuck in yesterday. Start small if you’re anxious about making big changes. Add orange, pink, and green pillows to every room, for example, or switch out your dried flower dining table centerpiece with a modern glass vase in one of the new colors. 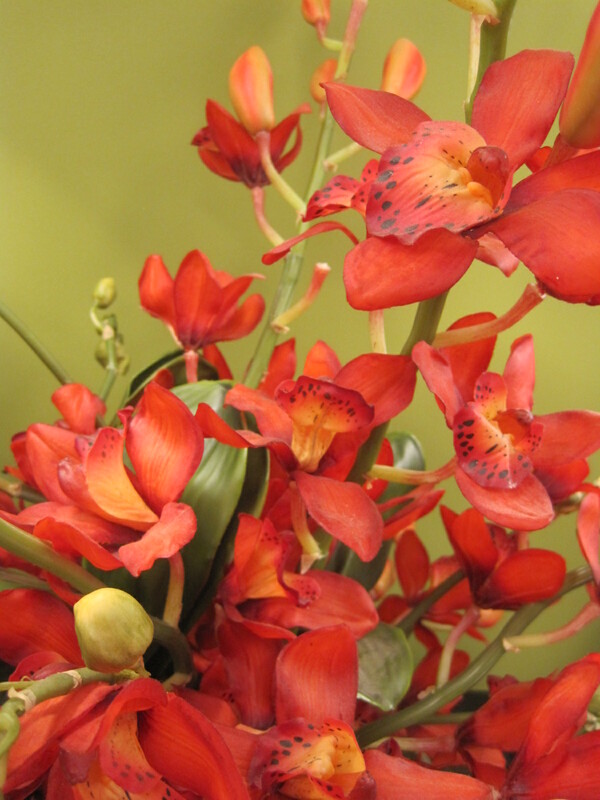 These optimistic tones speak of renewed vitality, prosperity and fun. Fall is a season of change. Make yours one to inspire! Pantone is the company that sets the color trends year after year. The business was originally founded by Lawrence Herbert in 1963 to solve problems encountered by graphic artists who needed help producing the most accurate color matches in their work. Herbert came up with a spectrum of coordinating and matching colors that artists could rely on when faced with difficult choices. The innovative fan color format has since morphed the company into the global authority on colors. Industries ranging from fashion to paint, from digital design to plastics, and from textiles to advertising rely on Pantone and its renowned language of color to set the pace for trends. There’s no doubt about it: braided rugs are back! Rarely a day goes by without our samples being excitedly thumbed through. Perhaps it’s because, as Norma and Elizabeth Sturges—authors of The Braided Rug Book—put it, braided rugs represent “hearth, home, comfort, family, and love.” Isn’t it amazing that a simple rug can conjure up all of that?! In the early years, wooden floors of American homes were covered with straw or rush-woven mats. These primitive coverings didn’t contribute much to a home’s comfort or warmth. While European rugs were available beginning around 1750, only the wealthy could afford woolen imports, so the average American used the straw they had. Wool did become readily obtainable in the states in the early 1800s, and, around 1839, the power loom made commercially produced rugs available. However, these coverings were still too expensive for the general public. So, New England housewives got crafty. They already knew how to braid straw mats, why not try the technique with wool, they thought. And the braided rug was born. Braided rugs were an extremely popular floor covering then, as they were more durable, warmer, and more decorative than their straw counterparts, all while remaining affordable options. Also called “rag rugs,” they could be created from leftover scraps of materials and even strips torn from old clothes and blankets. It’s thought that the braided rug reached its height of popularity in the early 1900s, during the Arts and Crafts movement. The housing boom and its promotion of wall-to-wall carpeting that occurred after World War II brought their—as well as area rugs in general—decline. Unfortunately, the craft of rug braiding experienced a decline in popularity, too, leaving fewer expert rug braiders to carry on the long-standing folk art tradition. Trends come and go, and despite going out of fashion in the 60s, braided rugs are now back on the scene. In fact, since many are taking a “green” approach to furnishing their homes and are opting for area rugs over carpeting—which can negatively affect indoor air quality—rugs in general are experiencing a rise in popularity. Just as they were in the 1800s, rag rugs are durable, comfortable, and affordable choices. They’re reversible and can be made of a myriad of materials—from chenille to cotton and acrylic to wool. They’re also, as mentioned in the opening paragraph of this post, symbolic of a simpler time. Rug & Home carries braided rugs by Colonial Mills, a Rhode Island manufacturer who is the leader in braided rugs and who blends old-school craftsmanship with innovative design. Their braided rugs are 100% U.S.A. designed and manufactured, plus, their styles and designs are fashion-forward with colors and patterns to coordinate with today’s home decors. You’ll find samples for almost every braided rug in their product line in our stores, and our design associates are happy to go through them with you to help find and order the best option. While you may begrudge the ordering process (and we don’t blame you; it’s nice to leave with a new purchase in-hand), we offer our braided rugs this way so you can get exactly the size, colors and materials needed for your space. And because it’s Rug & Home, you can get them for 30% off the suggested retail price! We’d love to hear why you’re single-handedly helping bring braided rugs back in style. Do you choose them for durability? Their cottage feel? Their symbolism? Comment here! Or, email us photos of braided rugs in your home, and we’ll upload them to our customer Facebook album! Sources: We consulted a variety of sources for this post. A Google search of “The History of Braided Rugs” brings up many articles. If you’re interested in learning the craft of braiding rugs, check out the book we mentioned published by local publisher Lark Books: The Braided Rug Book by Norma and Elizabeth Sturges, which also includes a detailed history of the craft. You can read a preview HERE. Today, Earth Day turns the big 4-0! It seems that awareness about the impact we have on our environment is now at an all-time high. And one could argue that it’s at the very least in part due to the campaign’s presence over the years. We see this increased awareness first-hand at Rug & Home, as the majority of the rug manufacturers we work with are taking the “greening” of their company and products very seriously—in some cases, even taking green to the extreme!